Nicolas Pépé has been highly sought after by a host of top European clubs. Recently, Barcelona joined Manchester United and Paris St. Germain in the race to sign the 23-year-old Frenchman. Barcelona was chosen the Lille forward, Nicolas Pepe as their major summer transfer target. This comes as no news given the Lille attacker’s recent form. Pepe has been in red-hot form in the Ligue One, scoring 16 goals in 25 games for Lille this season, while also providing eight assists for his teammates. 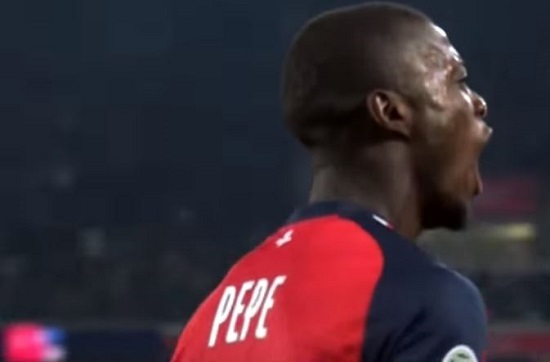 Here are three things to know about Nicolas Pépé. Although Nicolas Pépé was born in France, he is of Ivorian descent. He was born to parents of Ivorian descent on 29th of May 1995. He chose to play for Ivory Coast over France. On November 2016, Pépé got his first call-up to the Ivory Coast national football team. He, however, made his debut on November 15, 2018, in a friendly against his birth nation France at the Stade Bollaert-Delelis in Lens. The game ended at 0-0. It may come as a surprise to you, but Nicolas participated in the 2017 Africa Cup of Nations hosted in Gabon. Pépé was named in the then coach, Michel Dussuyer’s 23-man squad for the tournament. Unfortunately, he never played in any match as the Elephants were eliminated from their group. He has never scored in any competitive match for Ivory Coast. Pépé scored his first international goals in a friendly game against Togo in France. The match ended 2-2, and he scored both goals. Three days later, he scored another goal in a win against Moldova in the same stadium.